Comfort and convenience are the hallmarks of Jacob Ihle, D.D.S. and Erick Hallie, D.D.S. 's office operations. To ensure your convenience, below is the information you need about our hours, location, appointment scheduling, insurance acceptance and billing. 75 minutes is reserved for adults coming into our office for the first time for a visual exam, periodontal exam, cleaning and necessary x-rays. We accept most traditional insurance plans. We are a provider of Delta Dental. 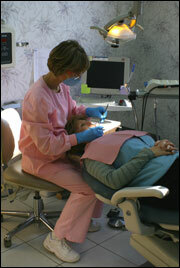 Our office staff will assist you in filing your dental claims. 5% discount for payment on the day of service using cash, check or credit card. Financing of 3, 6, 12 or 18 months with no finance charge to qualifying patients, using Wells Fargo or Citi Bank.